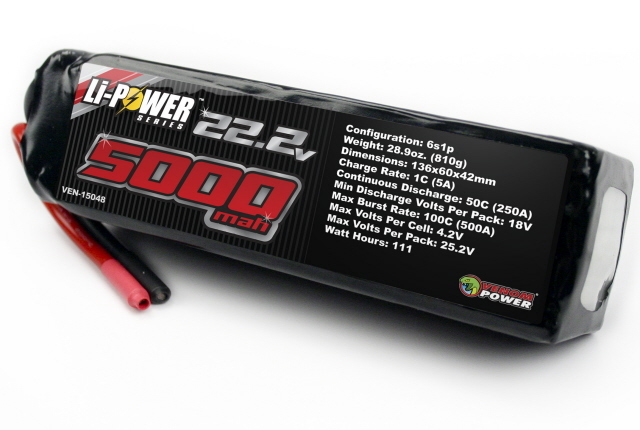 Venom is proud to announce the latest addition to their impressive line up of LiPO batteries with the release of their new 50C LiPO battery packs. Thoroughly tested and rated at a continuous 50C, Venoms new packs are capable of 10 second bursts at 100C and are available in a wide variety of capacities and configurations to fit almost any power application. Venoms new 50C Hard Case battery packs are perfect for the rigors of on and off road racing while the 2500, 3600, and 5000mAh packs are perfect for airplanes, helicopters and boat applications. All of Venoms new 50C LiPO battery packs feature heavy gauge wire leads and the hard cases feature Venoms new patent pending Universal Plug System™.